With Congress Virtually Out Of The Picture, What's Next For Iran Deal? : The Two-Way Senate Democrats succeeded this week in fending off a resolution to disapprove of the deal. All eyes now turn to the international arena, where the deal will begin to be put into effect. With Congress Virtually Out Of The Picture, What's Next For Iran Deal? 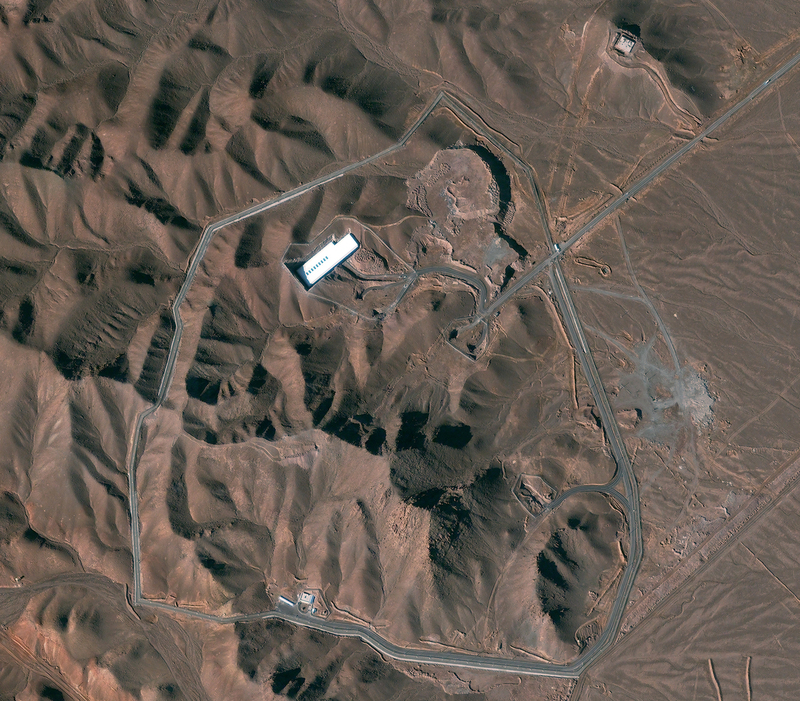 A satellite image shows the Fordow facility in Iran. 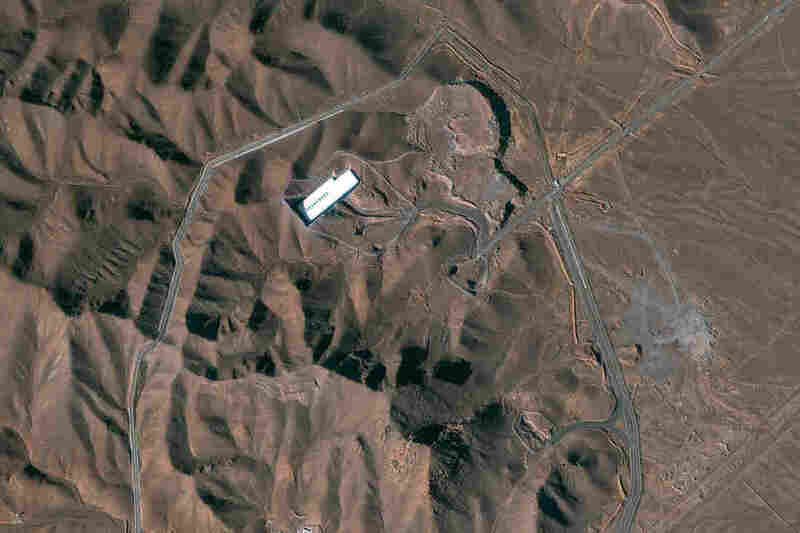 Under an agreement with six world powers, Iran would stop enriching uranium at the facility. With Senate Democrats successfully blocking a vote this week to rebuff the Iran nuclear deal, the American Congress is now virtually out of the picture. -- At this point, the U.S. and Europe would draft a plan to drop a series of nuclear-related sanctions. But Iran wouldn't receive sanctions relief until after "Implementation Day." -- According to Reuters, Implementation Day happens after the International Atomic Energy Agency verifies that Iran "has complied with nuclear-related measures." "Iran must reduce its large stockpile of low-enriched uranium to no more than 660 pounds from roughly 12 tons today — a 98 percent reduction. To do so, it will almost certainly have to ship fuel out of the country. It must also disassemble and store more than 13,000 centrifuges — it is allowed to have only 5,060 spinning — and convert the underground Fordo nuclear enrichment site to a research-and-development installation. Iran must also remove and disable the core of its heavy water reactor at Arak so that it cannot produce plutonium, another pathway to a bomb. It must also make arrangements for inspections and monitoring by the International Atomic Energy Agency and begin answering questions about suspected military-related work on nuclear weapons — although the answers may take years to resolve, if they are ever resolved." -- No one is quite sure when all of that will be done, but the European Council on Foreign Relations estimates four to six months. The Times says American experts estimate Implementation Day won't be official for six to nine months after Iran begins to dismantle its nuclear program. -- Once all of that is done, the U.S., the European Union and the United Nations would drop, or in some cases suspend, nuclear-related sanctions. -- According to the European Council on Foreign Relations, parts of the agreement begin to expire in 10 years. The clock on some of those parts are tied to Adoption Day, while others depend on the timing of Implementation Day. We've updated this post to reflect that Adoption Day could be Oct. 18 or 19. The JCPOA defines adoption day as 90 days after the U.N. signed off on the deal. That would make it Oct. 18. The State Department said Adoption Day would be "about October 18th." Iranian Deputy Foreign Minister Abbas Araqchi, however, said Adoption Day will be Oct. 19.